The surface of Mars has been the subject of fascination for centuries. Even sinceGiovanni Schiaparelli first announced that he had observed the “Martian Canals” in 1877, the Red Planet has been a source of endless speculation. Even today, crystal-clear images sent directly from the surface by rovers are still the subject of pareidolia – where people see familiar patterns in random features. Nowhere has this tendency of seeing what we want to see on the surface of Mars been made more clean than with the Cydonia region. Located in the northern hemisphere, this region of Mars is known for its many interesting land forms. The most famous of these is the “Face of Mars”, which has attracted immense scientific and popular curiosity over the past few decades. The area called Cydonia is in the northern hemisphere of Mars, in between the heavily cratered regions of the south (the Arabia Terra highlands) and the smooth plains to the north (Acidalia Planitia). 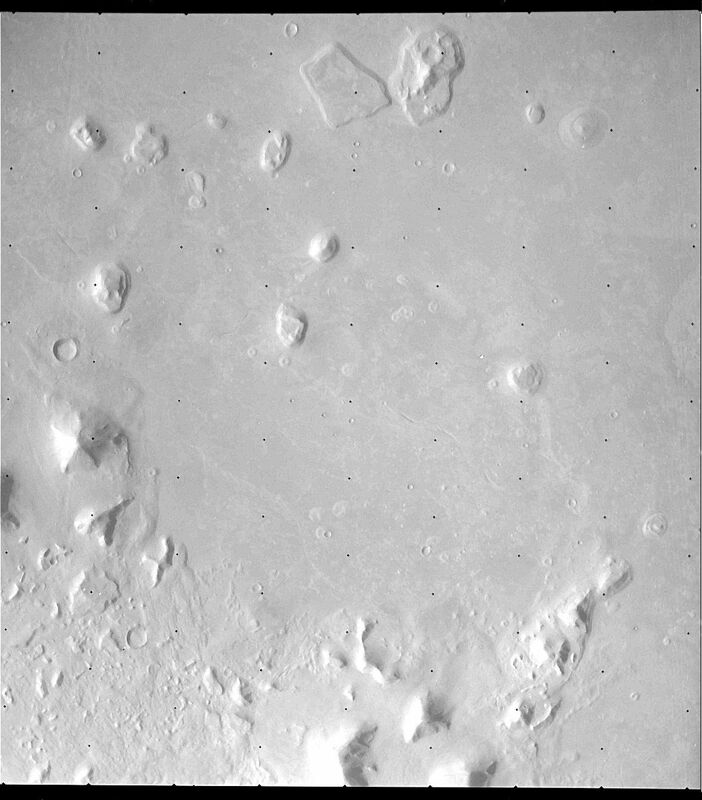 The area includes the regions of flat-topped mesa-like featured (“Cydonia Mensae”), a region of small hills or knobs, (“Cydonia Colles”) and a complex of intersecting valleys (“Cydonia Labyrinthus”). Because of its geographical location, it is possible that Cydonia was once a coastal plain region, billions of years ago when the northern hemisphere of Mars is believed to have been covered with water. The name – like many featured on Mars – is drawn from classical antiquity; in this case, from the historic city-state of Kydonia, which was located on the island of Crete. Cydonia was first photographed by the Viking 1 and 2 orbiters. Between the two, eighteen images were taken of the region, all of which were of limited resolution. Of these, only five were considered suitable for studying surface features. Because of their limited quality, a particular mesa resembled a humanoid face (see below). It would be another 20 years before other spacecraft photographed the region as they conducted observations of Mars. These included NASA’s Mars Global Surveyor, which orbited Mars from 1997 to 2006; the Mars Reconnaissance Orbiter (MRO), which reached the planet in 2006 and is still in operation; and the ESA’s Mars Express probe – which has been in orbit since 2003. Each of these missions provided images of Cydonia which were much better in terms of resolution and debunked the existence of an artificial “Face of Mars” feature. After analyzing images taken by the Mars Global Surveyor, NASA declared that “a detailed analysis of multiple images of this feature reveals a natural looking Martian hill whose illusory face-like appearance depends on the viewing angle and angle of illumination”. As already noted, Cydonia’s best known feature is the famous “Face of Mars“. This 2 km long mesa, which was first photographed by the Viking 1 orbiter on July 25th, 1976, initially was thought to resemble a human face. At the time, the NASA science team dismissed this as a “trick of light and shadow”. But a second image, acquired 35 orbits later at a different angle, confirmed the existence of the “Face of Mars”. Vincent DiPietro and Gregory Molenaar, two computer engineers at NASA’s Goddard Space Flight Center, independently discovered this image while searching through the NASA archives. From 1982 onward, these images would lead widespread speculation about what could have caused it, and fueled interest in the possible existence of a civilization on Mars. In addition, DiPeitro and Molenaar noticed several mountains near the “Face” that had angular peaks, which they referred to as “pyramids“. One in particular, a 500 meter-tall mountain located to the south-west, was especially geometric in shape. Richard Hoagland, a famous conspiracy theorist, dubbed it the “D&M Pyramid” (in honor of DiPietro and Molenaar), a name which stuck. Last, but not least, there is also the area to the north of the “Face” that was dubbed “the city”, because of its supposed resemblance to a series of monuments. These consisted predominately of more ‘pyramids’ that are arranged in a circular pattern around a series of smaller rocky features, known as the “City Square” (see below). Later images provided by the Mars Global Surveyor, the MRO and the Mars Express all resolved these features with far greater accuracy, showing them to be natural features with no evidence of construction of manipulation. In all cases, psychologists indicated that the desire to see familiar shapes and patterns was an example of pareidolia. And this was hardly the last time that this phenomena has happened with Martian features! In fact, the human race has a long history of seeing patterns within our Solar System and the cosmos in general. Consider the “Man in the Moon”, the Butterfly Nebula, and the “Mickey Mouse” on Mercury. As for the Cydonia region, future missions to the planet may take an interest in exploring it further. However, this will most likely to get a better understanding of the regions past and see it was indeed a coastal region at one time. There will be NO attempts to search for signs of ziggurats, pyramids, ancient sarcophagi, or any other indications of a lost civilization. We have written many articles about the Cydonia and other features on the surface of Mars. Here’s Extreme Close-Up of the Face of Mars, Pyramids on Mars, Detailed Deconstruction of the “Face” and Pyramids on Mars Claims, Faces and Animals on Mars? Pure Pareidolia!, Faces of the Solar System, No Humanoid on Mars, Just Rocks, and No, a Dinosaur Skull Hasn’t Been Found on Mars: Why We See Familiar Looking Objects on the Red Planet. If you’d like more info on Mars, check out Hubblesite’s News Releases about Mars, and here’s a link to the NASA Mars Exploration home page. We’ve also recorded several episodes of Astronomy Cast all about Mars. Start here, Episode 52: Mars. Bad Archaeology -Alien archaeology on Mars? As kids, my friends and I would stare at clouds on lazy summer afternoons and point out faces and animals we saw in their folds and domes. When the light was right, some of them looked as detailed and real as if chiseled by a meteorological Michelangelo. Later, with kids of our own, we often revisit this simple pleasure. Patterns can materialize anywhere – old men with scraggly beards in carpeting, blocky visages in road cuts and even Jesus on toast. Here are 50 more fun examples. Our instinctive ability to find patterns in the often random mish-mash of nature is called pareidolia (pair-eye-DOLE-ya). Maybe it’s simpler than that. Face-recognition is critical because we ultimately need each other for survival not to mention keeping track of the kids in the grocery store. Pattern recognition also helped us find food back in the days of hunting and gathering. The ability to distinguish a particular plant or animal against the background noise meant the difference between a full belly or starvation. Pareidolia also works its magic across the cosmos. To narrow the scope, I’ve selected images taken of Mars, the most fertile planet for imaginary faces around. Who doesn’t remember all the hubbub over the “Face of Mars”? Old Viking spacecraft images from the mid-1970s taken at low resolution in slanted lighting seemed to show a face carved of rock staring back at Earth. Since pareidolia works best when the stimulus is vague or the object unclear the “face” was perfect. Our brains are more than happy to fill in fictional details. Later photos taken at much lower altitude with higher resolution cameras made the face disappear; in its place we clearly see an eroded mesa. Then there’s the so-called “Bigfoot on Mars,” (an extremely very tiny Bigfoot) and later someone zoomed in on a small rock and said there was a gorilla on Mars. Information equals identity, lack of detail opens the door to anything we might imagine. Here are 10 examples of imaginary faces and creatures on Mars. The inspiration to write about the topic came from a series of recent “art” images taken with the THEMIS camera on board the Mars Odyssey spacecraft. The probe orbits Mars every 2 hours and carries three science instruments; the camera combines images shot in 5 wavelengths or colors of visual light and 9 in the infrared or heat-emitting part of the spectrum. Others were snapped by the Mars Reconnaissance Orbiter. All are NASA images, and I’ve taken the liberty to colorize several of the black and whites to approximate the appearance of the color images. Martians obviously have a sense of humor. This 2-mile-wide (3 km) unnamed crater was photographed in 2008 by the Mars Reconnaissance Orbiter. This crater chain with its wispy “wings” of impact debris resembles a wasp. The feature was most likely created when a meteorite arriving it at a very low angle broke into pieces just before impact. Lava flows in Mars’ Elysium Planitia region have left a rather good likeness of a woolly mammoth or elephant. The region is known for some of the planet’s youngest lavas – this one may have formed as recently as the past 100 million years. I love these two little hearts. The one on the left is a mesa top outlined by frost about the size of a football stadium. On the right, a small impact crater near the tip of the heart blew away dark surface material exposing lighter soil beneath. Some of the material appears to have flowed downslope to create the heart. The head and long beak of a hummingbird is easy to imagine in this scene. I can’t say for sure how these features formed but wind and erosion no doubt played a part. Martian bird of prey or just another wayward pigeon? The eroded blankets of ejecta blasted out when these craters formed look like a series of interlocking gears. Dark sand dune deposits look eerily like a howling wolf. These dunes remind me of a Minnesota “Thank you” for jump starting your car on a cold winter morning. Tectonic stretching of the Martian crust created this unusual right-angle fracture. I wonder how many other letters of the alphabet we might find on the Red Planet?